It is Sunday and the sun is shining. 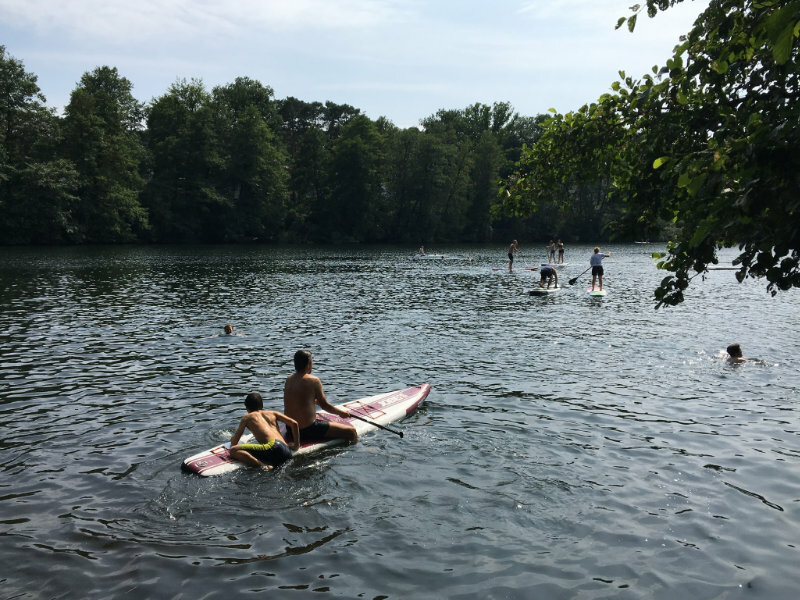 We were invited to try stand up paddle boarding in Berlin on the Schlachtensee Lake. 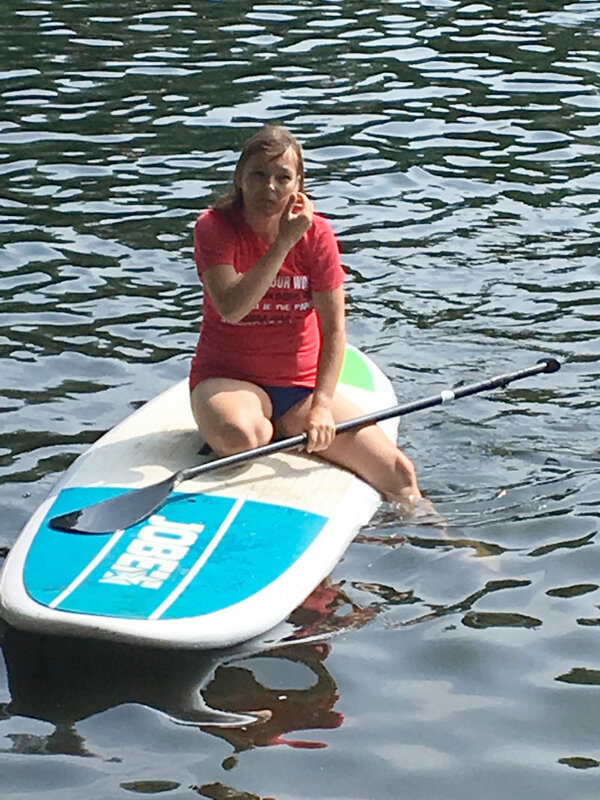 So, here we go to the Schlachtensee Lake in Grunewald.Before we started our stand up paddle boarding experience, we researched what SUP is and whom it is suitable for. Stand up paddle boarding is a water sports discipline. Standing on something that looks like a surfboard one moves across the water by paddling with a single bladed paddle. The stand up paddle boarding originated in Polynesia. Fishermen moved around in their canoes by paddling whilst stood up. In the 20th century stand up paddling was also used by surfing instructors on Hawaii. They moved quicker with the paddles and from their raised standing position were also able to see their learners better. Since the beginning of the 21st century stand up paddle boarding has developed into a leisure time activity and is now officially counted as water sports. There are even national and international competitions in stand up paddle boarding. There are two main disciplines, stand up paddle surfing and distance stand up paddle boarding. SUP surfing combines the paddling with surfing on waves. The paddle stabilises the athlete and is also used for manoeuvring. 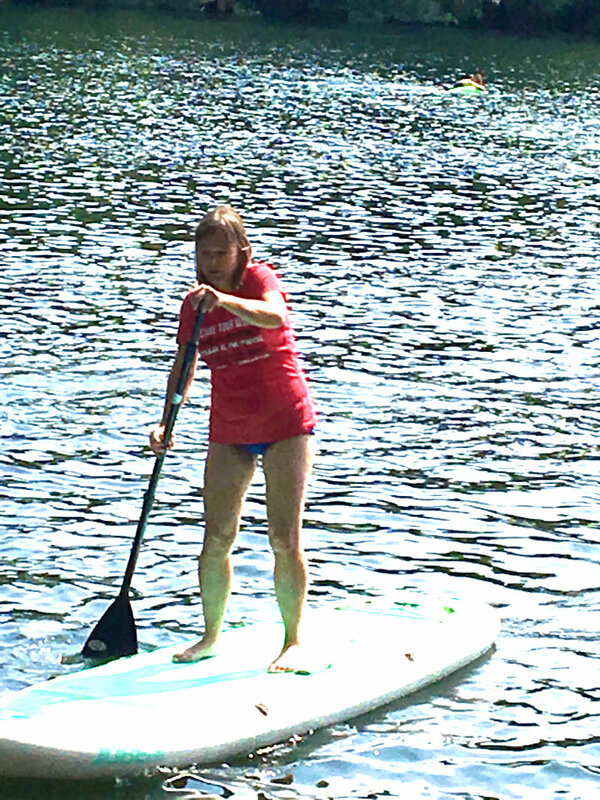 In distance stand up paddle boarding longer distances have to be mastered on the board. 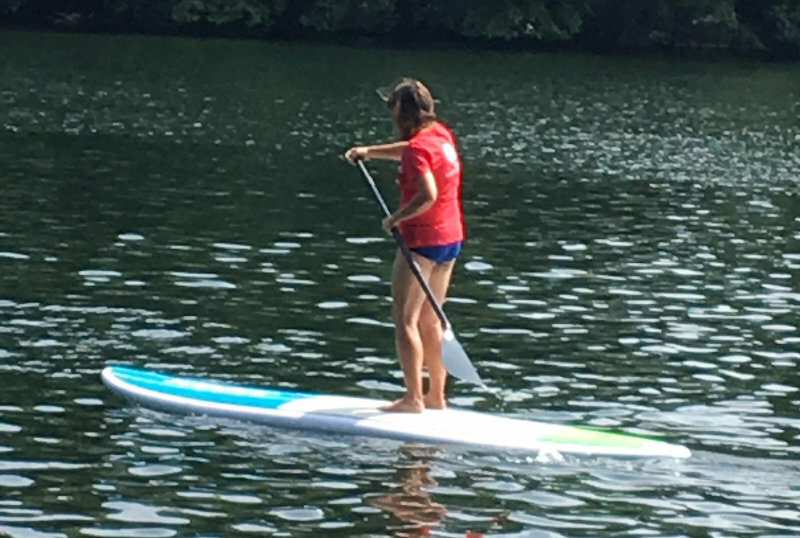 Who can learn stand up paddle boarding and what is needed to do it? Stand up paddle boarding is possible wherever there is water. Whether it is on a lake or in the ocean doesn’t matter at all. Besides a swimming costume, in case one falls or has to jump off, a bit of sunscreen could come in handy. Sun is always more intense on water. On top of that, you’ll need a paddle and a board of course. The paddle should be significantly longer than the height of the athlete. Different shops offer different fabrications and materials from fibreglass to simple aluminium paddles. The choice of boards is also huge. Different lengths, boards for different weights and boards made from different materials can be found in the shops. About a year ago inflatable boards appeared on the market that are far easier to transport than the regular boards. A little balance wouldn’t harm for those who’d like to try SUP. As you know, there are no stabilising beams under water and depending on waves and wind it can get pretty bumpy on the board. Other than that it is necessary to be able to swim. Most renting stations offer live vests for insecure swimmers, but you should be able to get back on the board by yourself when you fall. I think there is no minimum fitness level or age restriction when it comes to SUP. Whoever needs a break simply stops paddling and rests on the board. The team of steh-paddler.com invited us to try stand up paddle boarding in Berlin. In Berlin Zehlendorf at the Schlachtensee Lake by the Fischerhütte (Fisherman’s Hut) is where the paddlers have their base. This is where different boards can be rented and where courses take place. I was particularly interested in the birthday parties on water for kids and also the SUP-Yoga. I did yoga for years and also taught yoga for children, but to balance on water is a whole new experience I’m sure. We decided to rent a board and paddle over the Schlachtensee Lake by ourselves, making the most of our Sunday. We called the team before our arrival so that they knew we were coming. More spontaneous visitors might have to wait a little while before a board becomes available, especially when the weather is nice. But visits can be booked and paid online, even for the same day. The benefit of this is that you do not need to bring any valuables (which the team also happily stores for you behind their counter, at your own risk). Guests rent the boards for one hour (the team hands out waterproof watches). I did not count, but there were countless boards in the water near the reception area. Some children were sharing boards, not so much for SUP but more as a replacement for an air mattress, as something to jump into the water from or for balance exercises. Fun was mostly what this was all about. We were handed two boards and got our paddles set to the right height. We were asked whether or not we needed an introduction to how stand up paddle boarding works. It was obvious to me; stand up and paddle. So we kneeled on our boards and paddled away from the banks of the lake. Try standing up in the middle of the board, with slightly bend knees to counteract imbalances. After getting to a somewhat secure stance, the paddle can be inserted into the water near the front of the board and then slowly pulled back alongside it. Paddle on both sides – or otherwise the board will go in circles. We casually paddled across the lake for about an hour and enjoyed the sunshine. A little further away from the board rental place the lake gets quieter and becomes the ideal spot to enjoy the sun and the reflections on the water. A dream. We highly recommend visiting the Schlachtensee Lake and we will be back soon! Further information can be found on the website of the provider. 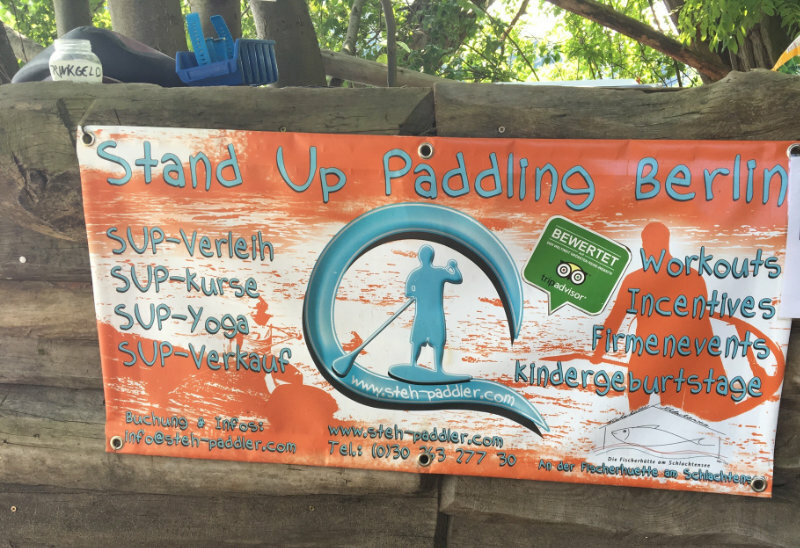 The experience of Stand Up Paddle Boarding on the Schlachtensee Lake in Berlin was sponsored by Steh-Paddler.com – Philipp Wilhelm and given to us for free. We would like to thank the provider! This blog post reflects our own personal experiences despite it being sponsored.